The midterm Senate race is fast approaching—and so are the speculations on its outcome. 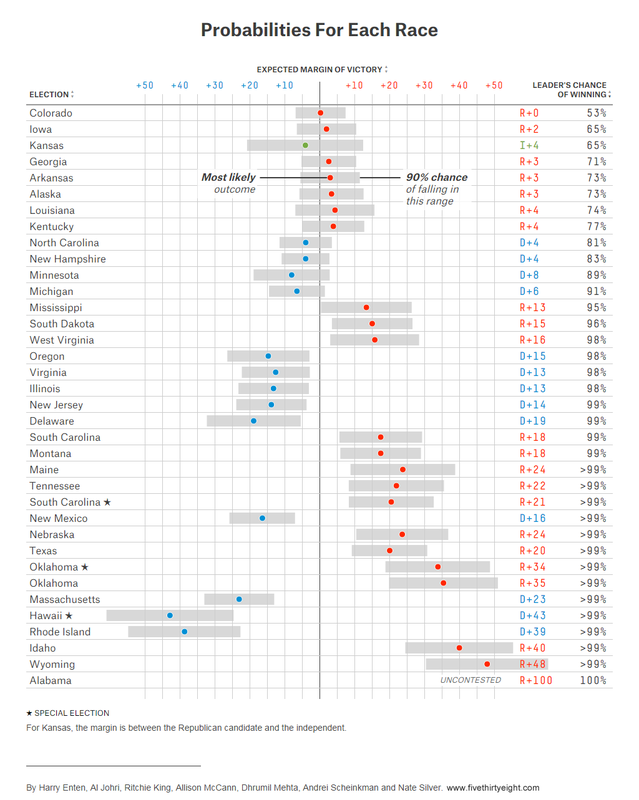 Previously, Lawrence W. Robinson, Professor of Operations Management at Cornell University’s Johnson Graduate School of Management used @RISK to statistically predict the senate races, using data from the stats-centered news site, FiveThirtyEight. FiveThirtyEight was founded by statistician and political analyst Nate Silver, who, in his forecasts earlier in the year, initially summed up the probabilities of either Democrats or Republicans winning all their races. Robinson took this analysis a step further by adding Monte Carlo simulation to the mix. While Silver warned in previous articles that to assume races are uncorrelated is “dubious,” and that Monte Carlo simulations requires variables to be uncorrelated, Robinson demonstrated that it is in fact very possible to include correlation in Monte Carlo analyses. He started by creating a “lower bound” (zero correlation) and an “upper bound” (total correlation) in his model, and showed that Democrats’ chances of retaining control only fell somewhere between 41% and 50%. Fast-forward a few months, and FiveThirtyEight’s models have gotten considerably more complex and data-rich, and their interactive forecasts are updated almost daily. 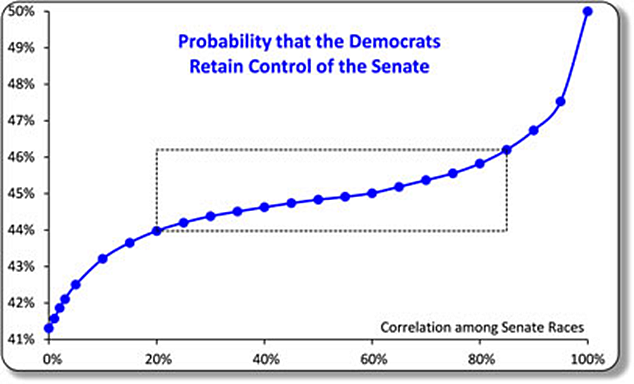 As of this writing, the model predicts that Democrats have a 42% chance of retaining the Senate next year. Unlike their earlier forecasts, “they’ve also included a correlation, of a type in their model,” says Robinson. “They do not explicitly use a correlation coefficient, as I did—instead, they change the distribution of the candidate’s lead.” Robinson explains that Silver and FiveThirtyEight introduce correlation through an additional random variable representing what they’ve labelled “national error,” which they generate and add to the mean margin of victory of every candidate. Interested in playing a political prognosticator? Check out our models here and run the @RISK simulation yourself.